The Internet of Things (IoT): By now, you’ve probably heard of it and know it’s a thing. This concept of hyper-interconnectivity and information sharing between everyday items such as washing machines, refrigerators, lamps, wearable items, engines, roads, bridges, and more is looming on the horizon. What it means is still a mystery, but one thing’s for sure: It will impact our lives in subtle and not-so-subtle ways, and that includes boating connectivity. 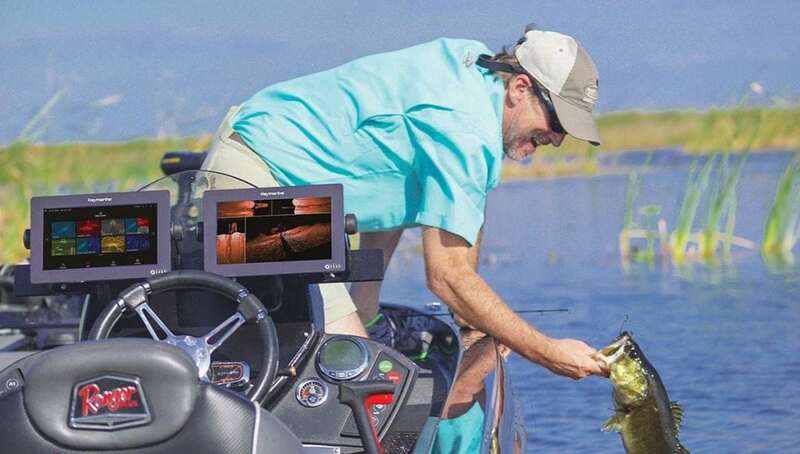 Always stretching the boundaries, marine electronics’ firms are developing a specific subset of the concept that could be called the Internet of Boats, and it’s all coming together in your multifunction display (MFD). The cost of connectivity is decreasing as broadband Internet becomes widely available. Today, most devices are integrated with multiple data-gathering sensors and WiFi capabilities so they can capture and share information. It’s more than just about connecting people to people; it’s connecting things to things. Anything with an on/off switch and an Internet connection can become a part of the IoT, so think what that means on your boat. Lights, pumps, engines, security and navigation equipment can communicate with each other and also with entities off the boat. Sounds like the Internet of Boats. Data sharing means engine and boat builders, accessory suppliers, dealers, service providers, and cruisers can have access to more information. Therefore boats, engines, and equipment can be built with less complexity so more cost effectively, and everything has the possibility of becoming more efficient, secure, social, and definitely user-friendly. For the cruiser, this may translate to increased confidence that your engines are healthy, that you have the latest navigation software and that the response time to fix problems will be shorter. That means you have a more supported adventure every time you untie the dock lines. Yamaha partnered with Garmin to power its CL7TM multi-touch display. Your boat can talk to you as well as to a dealer or a search-and-rescue provider. You can set geofencing boundaries so you know where your vessel is at all times. Your engines can remind you of scheduled maintenance or warn of impending problems. Digital switching systems like CZone can send reports on bilge pump cycles and battery levels. You can unlock enhanced features like Doppler radar on existing MFDs with remote software access keys without your boat needing to go in the shop or you having to purchase additional expensive hardware. None of this is really new, but what is different is the recognition of the power of the sum and the importance it’s bringing to the MFD. The MFD is evolving as the single point of convergence and problem solving aboard. Engines, radar, charting, and digital switching for onboard accessories are now brought into the MFD for both control and diagnostics. You can turn on your lights and stereo, check the weather, view remote cameras, review alarms, get engine diagnostics, and navigate—all from the MFD. 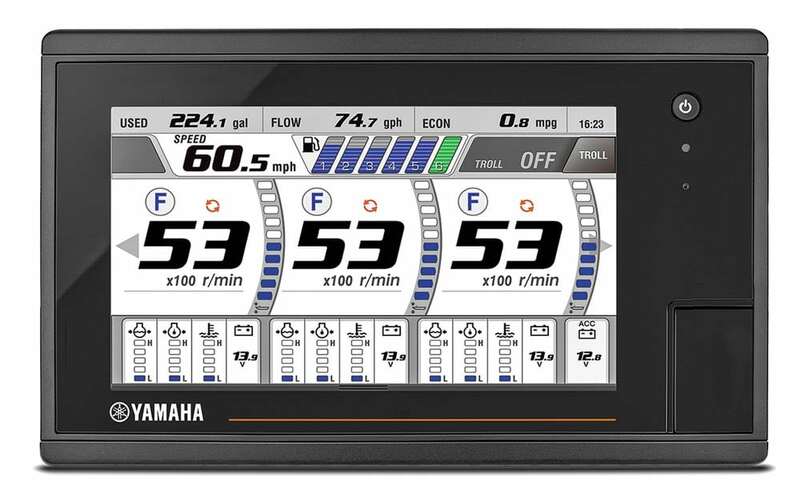 This wealth of information hasn’t gone unnoticed by electronics manufacturers like Navico (makers of Simrad, B&G, Lowrance), Garmin, Furuno, and Raymarine, who understand that he who owns the “glass” owns the data and thereby basically controls not only the boat but also the value chain and the ultimate cruiser experience. Challenges remain. First, boating is a relatively small industry with few consumer dollars at stake, so it won’t lead the IoT revolution. But to not take notice of it would be a mistake, even in our application. Second, data is great but unless someone can monetize it, nobody will have the incentive to pursue its development. Simrad is working to share information with engine manufacturers who in turn, can build engines better and faster so they’re willing to pay Simrad for it. Charter companies are in on both sides since they can gather more data to share because of the volume of users. They can also benefit from the distilled data coming back to better predict maintenance requirements so that their boats are always ready to go out and produce revenue. Third, onboard sensors can generate vast amounts of data, but that won’t make boating better unless someone figures out how to turn it into real information to build stronger, cheaper, cleaner, friendlier, and more efficient products. Marine electronics firms get this. Finally, although much of this happens behind the scenes, an intuitive user interface is critical so that cruisers want to get involved and enable the process. You already see MFDs mimicking the functionality of personal electronics like smartphones and tablets with pinch-to-zoom touchscreens and swipe commands. Expect to see more app-driven functionality to pop up on your chart plotter soon. If you think all this will make boating efficient, fun and more like the rest of our lives, you’re probably right. If you think future boating will become more complex, interdependent and possibly invasive, you’re probably right. Either way, it’s all most likely to happen right on your MFD, so upgrading electronics in the future will get you more than just new charts. The waters are still murky, but whatever it means, it’s coming. Boating will not be the same, and neither will your MFD.